George E. DiCenzo, age 87, passed away peacefully surrounded by the comfort of his loving wife on April 2, 2019. He was the son of the late Ernest and Mary (Faiella) DiCenzo. George was born on September 30, 1931 in Boston. He married his wife Jacqueline (Brogna) at Our Lady of Assumption Church in East Boston. He was the owner of GED Sales Company in Foxborough for many years. He loved to travel and was an avid Boston sports fan. He most enjoyed spending time with his family. He was a loving and devoted husband and father. 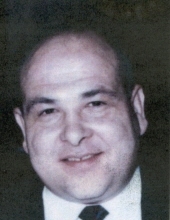 Devoted husband of Jacqueline DiCenzo. Loving father of the late Jacqueline Ann Corliss. Brother of Roger DiCenzo of Millis and the late Robert and Leonard DiCenzo. Relatives and friends are kindly invited to attend calling hours on Tuesday, April 9 from 4 PM to 8 PM at the Roberts and Sons Funeral home, 30 South Street, Foxborough. A Funeral Mass will be celebrated Wednesday, 10 AM at St. Mary’s Church, 58 Carpenter street, Foxborough. Interment to follow at St. Michael’s Cemetery, Boston. For additional information please contact 508 543-5471. To send an on-line condolence please visit the funeral home web site at www.robertsandsonsfuneralhome.com. If you wish, donations in George’s memory may be made to Boston Children’s Hospital, 400 Park Drive, Suite 602, Boston, MA 02215. "Email Address" would like to share the life celebration of George DiCenzo. Click on the "link" to go to share a favorite memory or leave a condolence message for the family.